Luke Rockhold vs Lyoto Machida at UFC on FOX 15 on April 18th, 2015. Rockhold wins via 2nd Round Rear Naked Choke. Luke Rockhold has a professional record of 15-3. In fights that he wins, he finishes his opponent 87% of the time. All 3 of his losses are from KO/TKO. Lyoto Machida has a professional record of 22-7. In fights that he wins, he finishes his opponent 50% of the time. In fights that he loses, 3 are from decisions, 2 from submission, and 2 via KO/TKO. Lyoto Machida is scheduled to fight Derek Brunson at UFC Fight Night 119 on October 28th, 2017. 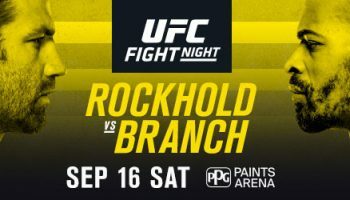 Luke Rockhold is scheduled to fight David Branch at UFC Fight Night 116 on September 16th, 2017.